Jim Wehba’s father was from Lebanon and his mother was Syrian, but he was born in Wichita Falls, Texas..
September 29, 1934: Jim Wehba was born in Wichita Falls, Texas and grew up in nearby Vernon..
Jim Wehba (age 12) started lifting weights and would eventually bench-press 500 pounds.. Early 1950’s: Jim Wehba was a high school football star (running back) out of Vernon, Texas before getting into wrestling. ~~~~~~~~~~~~~~~~~~~~~~Notes: Jim Wehba was a walking encyclopedia on the history of Texas high school football. 1963: Jim Wehba began his wrestling career, getting his start from the legendary Lou Thesz..
1966: Fritz Von Erich suggested he change his name to something that sounded more Arabic..
~~~He became known as “Skandor Akbar”, which translates to Alexander the Great..
1967: Skandor Akbar & Danny Hodge won the United States Tag Team titles..
~~~Skandor Akbar turned on his Danny Hodge and became a major heel..
November 24 1972: Jesse James defeated Skandor Akbar by DQ on the first ASWA card in Atlanta. 1974: Skandor Akbar won the National Wrestling Alliance’s North American Heavyweight title..
1977: Skandor Akbar retired from full-time wrestling and began managing other foreign heels..
June 22, 1980: Dory Funk Jr. & Andre The Giant & Brian Blair beat James J. Dillon & The Spoiler & Skandor Akbar in Tulsa, OK..
Skandor Akbar was so hated as a heel that he wore a bulletproof vest because of threats on his life..
Skandor Akbar was ambushed by mobs throwing rocks, his tires were slashed, windshield shattered, and chased in his car..
Skandor Akbar booked wrestling events with an outfit out of East Texas called Superstars of Wrestling..
Skandor Akbar now runs a training facility in Terrell..
September 29, 2005: Skandor Akbar celebrated his 71st birthday! November 5, 2005–Texas Professional Wrestling Association: Spoiler 2000 beat Action Jackson by DQ to retain the TPWA title..
~~~Spoiler 2000’s manager, Skandor Akbar, planted a foriegn object in Action Jackson’s pocket and resulted in a Disqualification..
January 20, 2006–Patriotic Pro Wrestling: Roddy Piper had a “Piper’s Pit” with Kevin von Erich and his son, Ross ..
~~~The segment concluded when General Skandor Akbar shoved Ross and Kevin put the claw on General Akbar!! 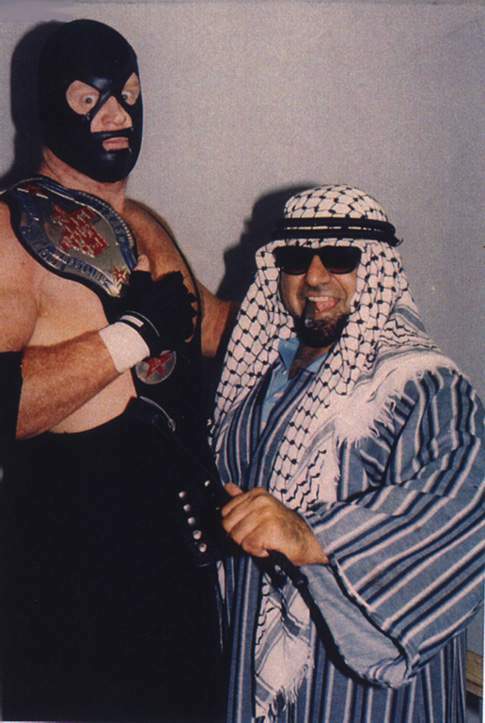 May 11, 2006–Acts Wrestling Alliance: Black Bart w/General Skandor Akbar beat Mark Von Erich to win the vacant ACTS title..
October 6, 2007–MSW: The Atomic Dogg (with Danny Hodge) defeated Prince Al Farat (with General Skandor Akbar)..
March 9, 2008–Texas Pro Wrestlig Association: Slam Shady defeated Bash w/General Skandar Akbar by DQ…. June 14, 2008–Mid-States Wrestling: Stephen E (w/General Skandar Akbar) defeated Jason Jones (w/Danny Hodge)..
February 27, 2010–Traditional Cham’p Wrestling: Tim Storm & Apoc w/Skandor Akbar beat Jett & Matt Riviera w/Danny Hodge..
August 7, 2010–NWA Legends Show: Kamala w/General Skandar Akbar defeated “Manscout” Jake Manning..
August 8, 2010–Wrecking Ball Wrestling: Matt Borne w/Skandor Akbar defeated Cody Knight to win the WBW Heavyweight title..
August 15, 2010–Wrecking Ball Wrestling: Matt Borne w/Skandor Akbar defeated Mandible Bull to retain the WBW Heavyweight title..
~~~This would be Akbar’s final wrestling appearance before her passed away several days later from Prostate Cancer at the age of 75..
February 26, 2011–New Millennium Wrestling (Texas): Skandor Akbar was inducted into the company’s Hall of Fame..
Tony Martin WBW wrote (August 19, 2010): Wrecking Ball Wrestling is saddend by the passing of Pro Wrestling greatest manager Skandor Akbar. Akbar, whose given name was Jimmy Wehba, appeared last Sunday in Dallas, Texas managing Maniac Matt Bourne. He was scheduled to appear again this Sunday. Tony Martin wrote again (August 23, 2010): Ak had been a regular the last couple of years for [Wrecking Ball Wrestling]. Feuding against the current crop of babyfaces; Cody Knight (whom he called a wannabe Von Erich), Billy Club, and The Bong Brothers. The final WBW version on Devastation Inc. was Dr.Knuckles, Rommel, Abu, Matt Borne, and Bob Mauldin. His final match was Aug. 15th managing Matt Borne. His knees where so sore Matt and Dr. Knuckles had to help him to the ring. He was scheduled to appear on Aug. 22nd, Instead Local talent turned out to honor him before the show. Published in Dallas Morning News on August 22, 2010 : Wehba, Jimmy Saied 75, of Garland, Tx died Thursday, Aug 19 in Dallas. He was born Sep 29, 1934 in Wichita Falls , Tx to Jim and Mary Wehba. Jimmy attended schools in Vernon, TX graduating from Vernon H.S. in 1952. He also served 2 years in the Army primarily in Germany. Jimmy, also known as Skandor Akbar and General Akbar was a professional wrestler for many years. He wrestled in venues across the United States including the Superdome in New Orleans and Madison Square Garden. His travels also took him internationally where he wrestled in numerous countries including Australia and Japan. His bouts at the 4H barn in Wichita Falls were legendary. In his later years, Skandor promoted wrestling events across Texas, Louisiana, and Oklahoma and also managed the famous wresting team known as “Devastation Incorporated.” He will be missed dearly for his many colorful stories, his extensive knowledge of high school and college football, and his loving and kind spirit. Jimmy is preceded in death by his parents, his wife Doris, and sister Helen Burdick. He’s survived by a son Darryl Wehba and grandson Trevor Wehba of Duncan, OK, a sister Dianne Cluley and husband Ken of Wichita Falls, a step-daughter Debbie Whelan and a step-granddaughter Kaley. Survivors also include nieces Patty Park and husband Randy, Karen Meredith and husband Jimmy, and Katie Dye and husband Richie all of Denton, TX. Nephews Frank Burdick of Corpus Christi, Kenny Cluley and wife Mary Ann of Berryville, TX, Joey Cluley and wife Lindsey of Waco, TX, Eddie Cluley and wife Mary, Jerry Cluley and wife Vicki, Timmy Cluley, and John Cluley and wife Rhonda all of Wichita Falls. Jimmy is also survived by special friends Sandy Nance and Tim and Janet Cowan of Garland, TX and many cousins, great and great great nephews and nieces. Funeral services will be at 10am Tues, August 24 at Our Lady Queen of Peace Catholic Church 4060 York, Wichita Falls, TX. Arrangements are under the direction of Lunn’s Colonial Funeral Home 940-692-1913.